In today’s world there is need of building homes, which are tough and sturdy. 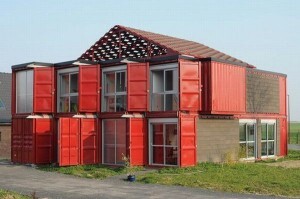 Shipping containers can be reliably used as the foundation for such houses. 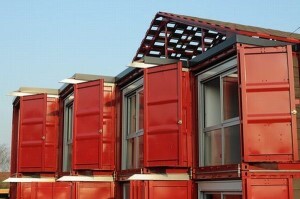 Moreover, the best thing about shipping container houses is their portability and inexpensiveness. Recently, an architect named, Patrick Partouche came up with an idea of making a house with eight shipping containers within the countryside of Lille, France. The house is designed for single family use. The most interesting aspect of the recycled shipping container house is its design and structure, which are both high tech. The construction was done by transporting containers through trucks and assembling them with cranes. It took three days for completing the whole setup. For the interior, the designer used industrial style, while not forgetting the use of quality material. The interior is stylized with checker plates, exposed conduit and metro wire, and it blends well with the exterior aesthetics of the container house. The architect has also used materials such as industrial lamps for lightning, old trunks for storage, handrail made out of wire,welded pipes and corrugated steel. This house is a true reflection of how we can deal with durability and cost constraints of today’s world. It is symbolic of the new cult of innovative architecture, which employs the reuse of sources like shipping containers, without putting much strain over scarce resources. This entry was posted in Blog and tagged shipping container architecture, shipping container designs, shipping containers.